Located on the Costa del Azahar, the East coast of Spain, Valencia is the third largest city in the country, and the capital of the autonomous community of Valencia and the province of Valencia As of the 2006 census, the population of the city itself was 807,396, and of the metropolitan area (including satellite towns), in excess of 1.8 million. Welcome to the most Complete VALENCIA SPAIN Travel Guide for Tourists made by locals! If you are heading to the wonderful city of Valencia anytime soon this book will give you an insight of the best places and most unique places in town where you will mingle with the locals and get to see and do the activities as one of them. Most people don't even take the time to prepare themselves in advance, and just wish for the best once they have arrived! Most people aren't aware of some of the most amazing places Valencia can offer... And it'd be such a pity to miss them! That's precisely why we desperately need the RIGHT travel guide first. Don’t arrive to Valencia and follow the crowds of Tourists. With this exclusive travel guide made by locals you will be finding about the places that don’t come on Lonely Planets or are listed on Trip Advisor where thousands of tourists head daily. Our goal is simple. we will give you a complete and detailed Bucket list with MAPS to all the locations to make sure you won’t get lost in the amazing city of Valencia (Spain) transforming your trip into absolutely amazing experience. We will help you simplify your path, showing you exactly where the best places are. 8 Guides in 1 - SUPER SPAIN PACKAGE DEAL ! Welcome to the most Complete Spain Travel Guide for Tourists made by locals! If you are heading to the wonderful country of Spain anytime soon this book will give you an insight of the best places and most unique places to see where you will mingle with the locals and get to see and do the activities as one of them. Most people don't even take the time to prepare themselves in advance, and just wish for the best once they have arrived! Most people aren't aware of some of the most amazing places Spain can offer... And it'd be such a pity to miss them! That's precisely why we desperately need the RIGHT travel guide first. Don’t arrive to Spain and follow the crowds of Tourists. With this exclusive travel guide made by locals you will be finding about the places that don’t come on Lonely Planet’s or are listed on Trip Advisor where thousands of tourists head daily. It took lots of time to incorporate the tips and hacks that ended up shaping this travel guides! And now, we are willing to share those secrets with you! Our goal is simple. we will give you a complete and detailed Bucket list with MAPS to all the locations to make sure you won’t get lost in this 8 top destinations in Spain transforming your trip into absolutely amazing experience. We will help you simplify your path, showing you exactly where the best places are. Are you planning a trip to Spain? Always been in love with everything Spanish? Simply browsing and dreaming of a European holiday? This book will put your doubts of whether going to Spain is worth it. This magnificent country has so much to offer for holiday visitors in terms of activities, festivals, food, drinks, sightseeing, nature, beaches, entertainment, sports and more. Plan your holiday with this clever extensive Spain travel guide. Or, if you were unsure of where to go for your holiday - allow me to introduce you to Spain and convince you to visit this magical, beautiful country. I am Todd Wright - adventurer, survivor, nomad, traveler and writer and I would like to present to you the beautiful Kingdom of Spain. Are you ready to learn about Spain? Ready to pack your bags and travel? Are you planning your next vacation abroad and you’re ready to explore? Do you want to be prepared for everything? Are you ready to experience every new place you visit just like a local? Well, with this amazing Valencia (Spain) travel map you’re all set and ready to go! The Valencia (Spain) map was carefully designed to give you amazing results and make traveling easier than ever. We make sure to constantly update our info to give you the most relevant and accurate information, so you will never get confused or frustrated during your Valencia (Spain) trip. The map is very detailed and it will not only give you all the available roads and routes, but also the essential information to make your Valencia (Spain) vacation unforgettable. In the Valencia (Spain) map you will also find the best places to go shopping, the most famous and must-see sights, churches and more. Valencia, Spain in 3 Days (Travel Guide 2019): A Perfect 72h Plan with the Best Things to Do in Valencia: Includes Online Maps,Detailed Itinerary,Local Secrets.Written by Local Experts & Bloggers. We wanted to visit Valencia and got lost into spending tens of hours looking for valid information at Lonely Planet, TripAdvisor and on the Internet. And then, we couldn't put it all together, to create a perfect plan for visiting Valencia in 3 Days. We provide exact 72 hour plans with only one and best choice on where to stay, what to eat, what to see. It's an easy travel path that you just follow and spend the 3 best days of your life in Valencia! If you are wondering What to Do in 3 Days in Valencia and What are the Best Things to See, look no further! We have built an excellent 72 hours plan for Valencia, with information on what to do every hour of the day. All the information provided is by local experts and travel bloggers. Since they live in Valencia, or travel there often, they know the best that the city has to offer to you. 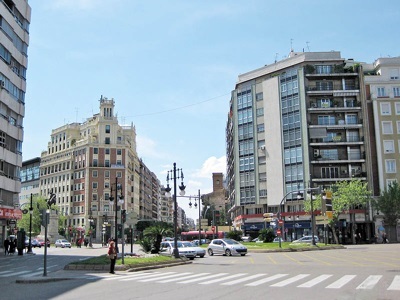 - Exact information on what is the best hotel to stay in Valencia, so that you will be in the best area of Valencia for all activities, without breaking the bank. - How to transport with bus, tram or metro. Detailed names of the bus numbers and the station names you will use. By getting this guide, you will feel like having your best friend in Valencia, showing you around. It will save you time and money in a stress-free way. It will help you to enjoy the best days of your life in the magnificent town of Valencia! Guidora's Valencia in 3 Days Travel Guide, is your entry ticket to the most accurate advice on what are the best things to do in Valencia in 72 hours. It includes a detailed 72-hour plan from the first moment you will arrive in the airport of Valencia, until the moment you leave this amazing town. All the Maps are available in Google Maps, to help you navigate Valencia easy, through your smartphone. Information in this Valencia travel guide is up-to-date as of 2019. Free Bonus Included: 51 Travel Hacks for a Cheaper and Safer Trip. Get this Guide Now and enjoy your trip to Valencia!